The Fall Colors of the Sierras are magnificent. From the yellow leafed Quacking Aspen to the reddish brown shrubs and grasses, the mountains are painted with color. My favorite annual trip to photograph these awe inspiring colors is along Highway 88, from Silver Lake, over Carson Pass into Hope Valley. From Hope Valley to Markleyville and over Monitor Pass to Lee Vining. This is one photographic adventure that requires at least a few days to enjoy and photograph. There is so much beautiful color and if luck will have it, a few clouds in the sky. Just West of Mono Lake is Lundy Lake. Lundy Canyon actually extends into the NorthEast corner or Yosemite National Park. 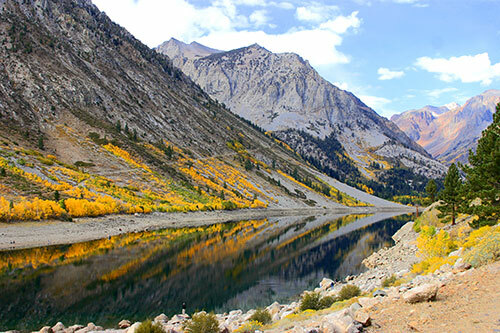 This shot of Lundy Lake is one of my favorites as the calm lake reflects the stripes of Fall Color. I have returned here several times and have never seen the lake this calm again! Printed at 12 x 18 inches, and matted and framed to 18 x 24 inches, this image is truly a wonderful capture of this beautiful scene.